We report an efficient co-precitation and subsequent annealing chemical route to synthesize porous hierarchical Mn-doped NiCo2O4 nanosheet architectures. The as-synthesized products exhibit unique porous hierarchical structures. When tested as anode materials for lithium-ion batteries, the Mn-doped NiCo2O4 architectures show excellent performances of Li+ storage. Under a current density of 0.5 A g−1, 5% Mn–NiCo2O4 electrode is capable of retaining a specific capacity of 1428 mA h g−1 over 80 cycles. Even at 2 and 5 A g−1, comparable capacities of 1220 and 987 mA h g−1 could still be achieved, indicating a superior rate capability. Ex-situ XRD, HRTEM measurements reveal the electrochemical mechanism of NiCo2O4 architecture anode. On basis of above analyses, the excellent electrochemical performances of porous hierarchical Mn-doped NiCo2O4 nanosheet architectures should be ascribed to the following aspects. (1) The self-adsorbed 2D nanosheet hierarchical multilayer architectures are favorable to the infiltration of electrolyte and beneficial to the available space for lithium ion diffusion. 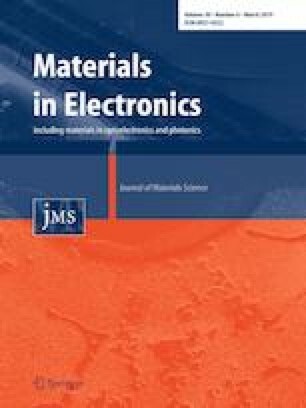 (2) Mn doping and multiple nanosheets may synergistically enhance the electrical/ionic conductivity, reversible capacity, and mechanical stability of electrodes. (3) Porous continuous network structure can enlarge the contact area of Li2O and Ni, Co, CoO nanoparticles, thus improves the Li+ storage and rate performance of NiCo2O4 -based electrode. The online version of this article ( https://doi.org/10.1007/s10854-019-01176-5) contains supplementary material, which is available to authorized users. We acknowledge support from the project supported by the State Key Program of National Natural Science of China (No. : 51532005), the National Nature Science Foundation of China (Nos. : 51472148, 51272137), the National Youth Science Foundation of China (No. : 51702177), and the Tai Shan Scholar Foundation of Shandong Province.